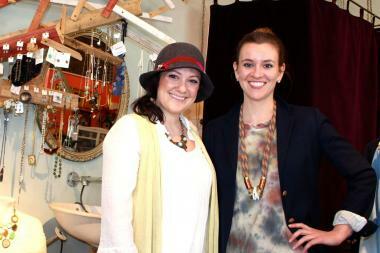 Bethany (left) and Alyssa Thomas pose inside Comfort Me, which they run along with their mother, Melanie. Models from 16 shops, including newly opened Frimson, will showcase both men's and women's spring styles during Lincoln Park After Dark on April 11 from 7 to 10 p.m. They'll be joined by a dog showing off the latest trends from Barker & Meowsky. "We want there to be more cohesion with the neighborhood," said Alyssa Thomas, who runs Comfort Me, 701 W. Armitage Ave., with her sister, Bethany, and mother, Melanie. "We want people to walk the whole neighborhood, not just go to one or two stores." Some of the looks that Bethany Thomas expects to see on the runway include bright greens, other flashy colors, maxi shorts, prints and polka dots. "It's a preview for most boutiques' spring lines," she said. Attendees will be able to buy items on site through a brand new iPhone app called walk.by. The Lincoln Park Merchants Association held the first event in the fall, which was attended by about 250 people. "It was great. A ton of people came. We ran out of alcohol and had to run out and get more, so that's always good," Bethany Thomas said. The event will be held at Essentia Natural Memory Foam Mattresses, 2118 N. Halsted St., and will include cocktails and hors d'oeuvres from local artisan shop Oh, Olive!, 904 W. Armitage Ave. The event is free and will feature a DJ, and the first 100 guests will receive a "swag bag." Participating boutiques include Piper Boutique, Fortunate Discoveries, Eclectic Chic, Frimson, Barbour, Laudi Vindi, Underthings, Shop857, Moi Boutique, Peruvian Connection, Londo Mondo, 1154LiL, Barker & Meowsky, Kickin, Camelot and Comfort Me. Doors open at 7 p.m. and the fashion show starts at 8 p.m.